DIMENSIONS: (19W x 20L x 15H) The Noah's Ark 5-in-1 combo bouncy castle will bring in attendants, two by two! Show off the story of Noah's Ark at your next event, with endearing artwork that features pairs of zebras, hippos, dolphins, elephants, giraffes, monkeys and lions. The bouncy castle is sure to entertain as kids of all ages can participate in five different activities for hours of Biblical fun. The 5-in-1 bouncy castle features a smiling, three-dimensional sun and two doves carrying olive branches above the sleek and slick slide. 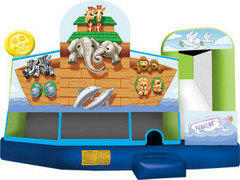 The Noah's Ark is one of many thematic options offered in jump and combo bouncy castles from Ninja Jump. The 5-in-1 combo style bounce house is the ultimate in inflatable jumpers! The large interior jumping area offers a basketball hoop and both log and pop-up obstacles. This bouncy castle has a climb feature and a convenient exit slide for hours of active fun! Parents and spectators are offered a clear view with the 360-degree mesh sides of this moonwalk. The 5-in-1 combo bounce house is made of lite n strong™ fire-resistant vinyl for safety, durability and easy portability. This 5-in-1 bouncy house is sure to make any indoor or outdoor event a great success!